Build a DIY solar pool heater to heat your pool with the free power of the sun! And if you live in a very hot area, you can even use your Solar Heater to actually cool your pool at night. Since a solar pool heater is a passive use of solar power, it is highly efficient and very cheap to build and run. You probably already own the most expensive part you need to build a DIYsolar pool heater- the pump. If so, this project should be pretty cheap for you! The concept of a solar heater is very simple. All we have to do is expose as much water to the sun as possible, thereby collecting and storing the sun’s heat. In order to achieve this, we simply pump the pool water directly through a solar collector, let the sun heat up the water in that collector, and pump the heated water back into the pool. That’s all. The whole process consists of pumping your pool water through one or more collectors exposed to the sun, letting the water heat up, and exchanging the water in the collector with more water to heat up. One warning: The less sunshine you get where you live, the less efficient the system becomes. Yes, you can even heat water in Norway with solar collectors and if you set up enough collectors you might even built a hot water pool in Antarctica, but the installation costs go up (you need more square meters of collector space). But still in Antarctica and Norway, in the winter months without any sunshine, the pool will only be useful if you love ice-skating. More on that and what you can do later on. Also: Make sure that the water in the collector and pipes (and pool) never freezes! Freezing water expands with slow but brutal force. It will burst anything not expanding with it, such as your pool’s walls or collector pipes. So honestly it makes no sense to build a Solar Pool Heater when there is not enough solar radiation. Even if you own a canopied pool, the solar power potential on your site may not be enough. But again, with enough Solar Collectors (enough sqft or m2) and some solar radiation you will be able to heat any pool anywhere, at least in the summer (=direct and diffuse solar radiation). As a rule of thumb: You will need about 50%-100% of the surface of your pool as the surface for your collectors. You want to make sure you do not invest time and money in vain, for example if the panels you built are not sufficient. So make sure if you have enough solar radiation and the right space for enough collectors. By the way, I assume that you cover your pool at night or when no one uses it? This measure alone will save about 2/3 of the needed heating energy. If you do not use a cover, the size of the collectors will increase about threefold. So make sure that you use Solar Pool Covers or Solar Pool Rings. Water is such a great absorber of the sun’s heat, but is equally talented at radiating the heat back into the atmosphere. How many months of the year you run the Pool? It also plays a role how many months per year you want to use the pool: Four, six, nine, ten months? Full year round? Does it freeze in your area, having temperatures below 6°C/42°F, and if only for a few hours per year. Again, we have to make sure that the cold does not destroy the Solar Pool Heater. Since freezing water expands, but does not flow anymore. That means that the water turned-ice in your collector and piping breaks everything apart and the force of the freezing and expanding water is powerful. So if you are planning to have water in the piping and collector even in the time of the year with freezing temperatures, you have to make sure that the water cannot freeze. In freezing climates, your collector(s) will need to be glazed, meaning being glass covered. And adding antifreeze is dangerous, since you tend to swim in the antifreeze then. Don’t do that. And do not rely on the insulation to prevent freezing. It probably won’t. For using the collector in freezing temperatures, also the tubing within should be made from (much more expensive) copper, not simply from cheap heavy-duty rubber. And freezing water can even burst copper pipes. So it may be cheaper to just drain the pool collector and piping in winter, so freezing cannot happen. Therefore we will focus on building an unglazed solar pool heater on this page. This actually is the way I prefer it. It safes a lot of time, comes with instructions and an impressive guarantee… And includes everything we need. No gluing of rubber pipes from Home Depot. No scratching your head how to fix the collector on your roof. If you live in a warmer area and get along with 50% of the pool surface for the collector’s surface, you can get a ready-to-install professional system for about $600 (depending on your pool’s size). Far cheaper than the officially suggested $3.000-$4.000. I do endorse checking out poolcenter.com, because they take care not to use the optimal materials. For example make sure that the materials you use do not emit toxic waste into the water under the sun’s radiation. The sun might will dilute toxic substances within the plastic into water you then swim in…no good idea. So before you by from poolcenter.com or get all your stuff from your local DIY chain, ask the seller how the material behaves when the material, water and strong exposure come together. Do not settle for less than a good answer. a chemical reaction is started and leaks toxins into the water. Most plastic pipes are designed for the underground. There is a difference if solar power directly hits the plastic, or if the pipe is protected against the sun in the earth. Keep that in mind. So again I would prefer a prefab kit, although it may be a bit more expensive than DIY. I also suggest you have look at the description of the optional control system. This automated valve let’s you regulate the pool’s temperature by opening and closing the valve leading to the collectors. Want to build a Solar Pool Heater DIY? from someone who “has been there, done that” in Australia. Let’s call it the “Crocodile Dundee way. Panel construction does not require machining, welding or precision work of any kind. No special tools or skills are required to complete this project. We supply plans and a 14 page comprehensive set of clearly illustrated instructions to guide you every step of the way. All materials are available from hardware stores and garden shops. Solar pool heater panels can be mounted vertically on a fence or horizontally on a roof It’s as easy as ABC so give it a go. [We] specialise in designing low cost projects that any practical individual with basic handyman tools and ability can build. We avoid the need for special machinery or skills (e.g. welding) and ensure all our projects are made from readily available parts and materials. All projects are easy to build and are carefully scrutinised for quality and safety. We supply comprehensive, illustrated plans and construction manuals to guide you every step of the way. So let’s have a look at what’s needed for our little DIY project. If we take into consideration that a professional system usually costs around $3.000 to $4.000 I think doing this completely yourself for under $100 will only add to your enjoyment. They also come with a 60 day no-questions-asked money back guarantee. I told you, I like guarantees. Why do you not share how you built your own Solar Pool Heater with us? Please tell us how you did it in the comment field below… if it is a good story, we will feature it here with some images on HomeofSolarEnergy. 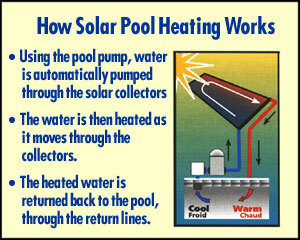 Still got a How to Build a Solar Pool Heater Question? If you still have questions, please go to my Solar FAQ and I will answer them personally. Or if I cannot, I will find someone who can. Back to Home of Solar Energy.